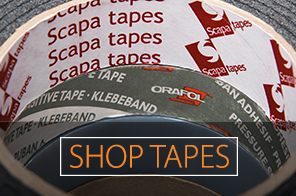 Tape Range holds an extensive range of technical self-adhesive tapes for every commercial and industrial application. Our highly skilled sales team can draw upon 30 years of trading experience to solve your adhesive tape requirement. Our informative and innovative approach to solving your application needs, makes us the UK’s number one choice for the supply and conversion of technical adhesive tapes. Foam tapes are a core product in our vast catalogue of adhesive tapes. Our stocks boast a comprehensive range of open and closed cell products to suit almost any cushioning, gap filling and construction application. Our foam tapes are held in master rolls and a full range of foam densities and thicknesses. We also coat non-adhesive foams, in house, with an adhesive tape of your choice.